Ringtone.net Ltd has been granted a permission to carry out “Flights at Night” from the Civil Aviation Authority, by demonstrating that we have the suitable equipment, documented procedures & governance to execute this activity safely. SUAS (Small Unmanned Aerial Systems), UAV (Unmanned Aerial Vehicles), “Drone” Operators require a Permission For Commercial Operation if they wish to fly their aircraft on a commercial basis (conducting ‘aerial work’ for payment or valuable consideration), or fly a camera/surveillance fitted aircraft within congested areas or close to people and properties that are not under their control. 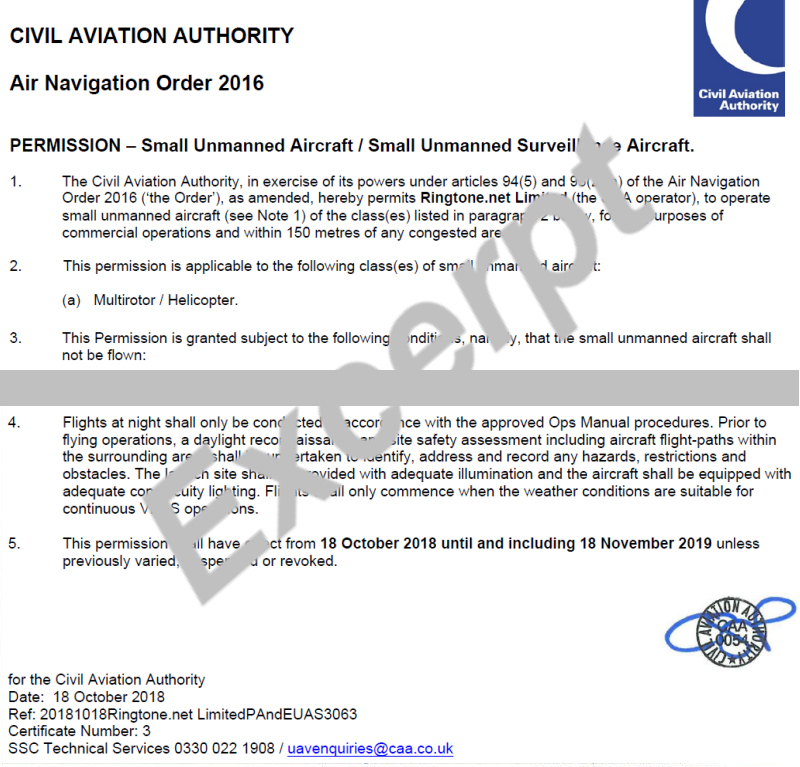 The CAA do not ‘Licence’ or ‘Certify’ SUAS Commercial Work (as some people and websites state) but issue a Permission for Commercial Operation (PfCO) under various Articles of the Air Navigation Order The Air Navigation (Amendment) Order 2018. Also using a Drone with a camera comes under ICO guidelines (see below). Please ask the Company Providing any Aerial Photo or Film work for you, to see a copy of their Operations Manual which will include the PfCO from the CAA and also a copy of their Insurance Certificate! Under normal conditions we are limited to a maximum flight ceiling of 400 Feet however most images are captured from much lower. We must also not operate the SUAS/UAV/Drone (Aircraft) more than 500 Metres away and must be in site at all times. We can create an Operational Safety Case and submit to the CAA for approval but most most operations can be completed within the standard limits. Article 94A: A remote pilot must not fly higher than 400 ft above the surface. Article 95B: A remote pilot must not fly a small unmanned aircraft closer than 1 km from the boundary of a protected aerodrome without first checking that you have permission to do so. 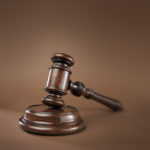 What is Permission for Commercial Operation? Permission for Commercial Operation is a CAA requirement if you wish to fly Small Unmanned Aircraft Systems (SUAS), small Unmanned Aerial Vehicles (UAVs) or drones on a commercial basis (conducting ‘aerial work’ for payment or valuable consideration), or fly a camera/surveillance fitted aircraft within congested areas or close to people and properties that are not under your control. (5) The person in charge of a small unmanned aircraft must not fly the aircraft for the purposes of commercial operations except in accordance with a permission granted by the CAA. The above sounds quite intimidating however we have been fully trained to ensure we comply with the legislation so as not to compromise your project. * The “150M rule” does not apply to us as we hold a PfCO and carry out a risk assessment to ensure the flight will be safe. Our PfCO (permission) can also take off and land within 30 metres of a vessel, vehicle or structure not under our control. We will need the landowners permission to take off and land. Means any unmanned aircraft, other than a balloon or a kite, having a mass of not more than 20kg without its fuel but including any articles or equipment installed in or attached to the aircraft at the commencement of its flight. * In the Air Navigation Order 2016 (CAP393), a congested area is referred to as ‘any area of a city, town or settlement which is substantially used for residential, industrial, commercial or recreational purposes.’ This could cover city centres, housing estates, hamlets, villages, retail parks, theme parks, shopping centres and even public parks. The ICO recommends that users of drones – also called unmanned aerial systems (UAS) or unmanned aerial vehicles (UAVs) – with cameras, should operate them in a responsible way to respect the privacy of others. If a drone has a camera, its use has the potential to be covered by the DPA. If you are using a drone with a camera, there could be a privacy risk to other people. Please ensure you respect people’s privacy when using your drone. I have complied with all of the regulations stated above and am going to take some aerial photos of my neighbours house for him as a favour. Is this OK? Probably not! CAP722 states that ANO 2009 Article 259 ‘Meaning of Aerial Work’ details that a flight is for the purpose of aerial work if valuable consideration is given or promised in respect of the flight or the purpose of the flight. This means it’s not just money that needs to change hands!